A cameraman recently managed to capture one of the most bizarre and beautiful cloud formations ever witnessed during a picturesque sunset. 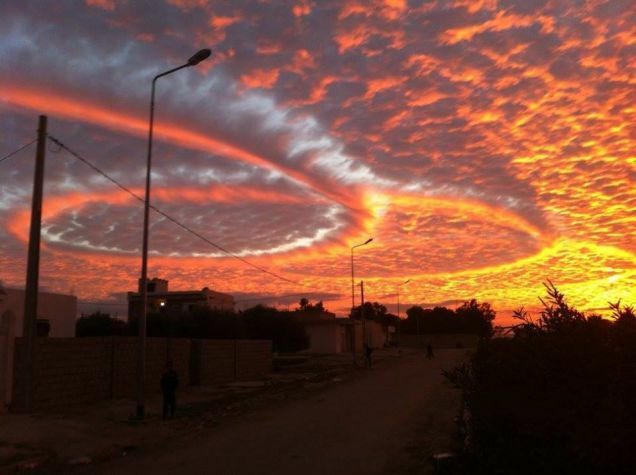 The strange coils of clouds were seen above Tunisia earlier this month, however people are unsure how such an amazing pattern was created. While some people went with the easy options of ‘photoshop’ or ‘aliens’, others suggested a more realistic explanation. The folks over at The Vane figured out that the swirls were caused by a rare weather phenomenon in which the water droplets in the air are colder than zero degrees, however they are so pure they are unable to freeze. It is thought that a military plane flew through the clouds, introducing some dust to the droplets, the droplets froze leaving a visible mark of where the plane had travelled. After a couple of loops the plane left the area, leaving behind the peaceful and beautiful scene the cameraman was able to capture. The Met Office say this effect is called ‘distrails’ which is short for dissipation trail, and when combined with a sunset can create some spectacular imagery.